Opechancanough Mangopeesomon Opechan Stream Powhatan, Wahunsenacawh Powhatan, Opitchapam Powhatan, Winganuske Powhatan and Wahanganoche Powhatan. This family tree is also found on the website geni.com as well as on ancestry.com. What, if any, of this is correct, or at the very least provable. I will try to pick it apart for you. Iopassus, was the younger brother of the Great Chief of the Patawomeck Tribe. The Patawomecks were part of the Powhatan Confederacy, but did not always agree or go along with Wahunsenacawh's decisions. The English called Iopassus Japasaw or Chief Passapatanzy, the name of his town. In 1612 the Patawomecks made a defensive alliance with the English against the Powhatan. Iopassus is most famous for his part in the abduction of Pocahontas by the English in 1613. She had been visiting his town on a trade mission, acting as an emissary for her father. Samuel Argyll convinced Iopassus to help him lure Pocahontas onto his ship and the rest is history. One last thing about Iopassus. He could not have been the father of Winganuske, one of Wahunsenacawh's many wives, as this would mean that brother and sister married each other. ick! So, going back to our original name of Powhatan's father I have crossed out that of Iopassus, aka Japasaw. 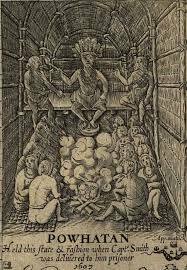 In about 1622 Opechancanough and his brother Opitchapam changed their names. Opechancangough became Mangopeesomon and Opitchapam took on the name of Sasawpen. This change came as the Powhatan Indian leaders were preparing for war against the English. Helen Rountree believes that the change indicated a "kind of military preparation, probably one with strong religious overtones." This name changing was not uncommon, in fact, Opitchapam had changed his name once before to Itoyatin. Massasoit, the Great Chief of the Wampanoags, who helped the Pilgrims of Plymouth Colony, changed his name to Wassamagoin. 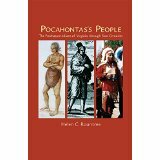 No other Powhatan Indian was recorded as using the name Mangopeesomon. Obviously, the father of Wahunsenacawh was not called Mangopeesomon, so I am crossing it out. Weroance I-Opassus Running Stream Mangopeesomon "Ensenore Algonkian Don Luis Velasco Japasaw Passapatanzy Powhatan. In 1585, Sir Walter Raleigh, sailed with his third group of colonists, hoping to establish themselves on the shore of North Carolina on Roanoke Island. This land, which seemed empty to them was actually occupied by a tribe of Algonquin Indians under the leadership of Chief Wingina. The Island as well as the mainland across from it was under his control. The Indians did not welcome the invaders with open arms, and Wingina began to rally other tribes to attack the new colony. His father, Ensenore, cautioned against attack. The pause in hostilities lasted until Ensenore's death.Notably, Wingina changed his name to Pemisipan. Well I think that rules out Ensenore as the father of Wahunsenacawh. He was from an Algonquin tribe that lived south of the Powhatans of Virginia, i'm crossing this name out as well. In about 1559-1560, a young Virginia Indian, visiting the Carolina Sounds met with Spanish explorers. The Spanish were known to take young people to train as translators, as at that age they were still able to quickly learn a foreign tongue. This Indian boy whose name was Paquinquino, was likely born about 1550. He remained with the Spanish, who baptized him and renamed him Don Luis, for about ten years. Don Luis returned to Virginia with a small group of Jesuit priests who wanted to establish a Spanish mission, the location of which was at the mouth of the Chickahominy River. For this reason he is believed by many to have been a member of the Paspahegh Tribe, as this was the location of their home. When Wahunsenacawh inherited his chiefdoms, the Paspaheghs were not among them. Paquinquino was also not the right age to have been Wahunsenacawh's father, they were more likely contemporaries. Some people theorize that he may have been Opechancanough, but that is a story for another day. I am taking the name Don Luis off the table. Finally we are left with the name Running Stream and Powhatan. Powhatan was the name of the tribe that lived near the fall line on the James River, some distance upriver. He took/was given the name Powhatan from the name of his tribe of origin. So, where does the name Running Stream come from. There is no documentation for such a name. There are no scholarly articles that mention this name. I wrote to a Pamunkey blogger and asked if he knew of any source for the names of Powhatan ancestors and he said he had never heard any of the names I gave him. The name of Powhatan/Wahunsenacawh's parents are unknown, they were never recorded by the English and they have not been passed down through time. Bill Deyo, "Virginia Indians Today, Patawomeck Indians of Virginia," Virginia 's First People; Past and Present (http//:www.virginiaindians.pwnet.org : accessed 10 March 2016). "History of the Patawomeck Indians," Patawomeck Indian Tribe of Virginia.org : accessed 10 March 2016). "History of the Patawomeck Indians"
 Bill Deyo, "Virginia Indians Today." Helen Rountree, Pocahontas, Powhatan and Opechancanough, Three Indian Lives Changed by Jamestown, (Charlottesville: University of Virginia Press, 2005)23. Helen Rountree, "Opechancanough," Encyclopedia of Virginia (http://www.encyclopediavirginia.org/opechancanough_d_1646#start_entry : accessed 10 March 2016). Lee Miller, Roanoke: Solving the Mystery of the Lost Colony, (New York: Arcade Publishing, 2000) 293. F. Roy Johnson, "Pemisapan", NCpedia (http://www.ncpedia.org/biography/pemisipan : accessed 11 March 2016). Helen Rountree, Pocahontas People, The Powhatan Indians of Virginia Through Four Centuries, (Norman: University of Oklahoma Press, 1990). you are right powhatan name was do Luis Velasco .Velasco was a Roa\yal name of the spanish empire,were the royals were is god Parentss his name was also (Uruch Beg) the word beg stands for Bag, baig are bey which meaens Chief of the Ottoman empire=Ottopomtacke.Powhatan uncle was name Hossein Ali Beg bayat .Beg is Short for bagby=adastra which they came from astrakhan .this is why they wore the turkey feathers. Crown Prince el Bey, thank you for reading and making such an interesting comment on my blog. I look forward to any further information you may have on the Powhatans of Virginia.